Artist’s depiction of the extinct monitor lizard, with its third and fourth “eyes,” or light-sensitive organs, atop its head. An ancient species of monitor lizard that went extinct some 34 million years ago had four eyes, according to new research. It’s the first time that scientists have ever seen such a thing in a jawed terrestrial animal—an observation that’s filling a gap in our understanding of how these features evolved. 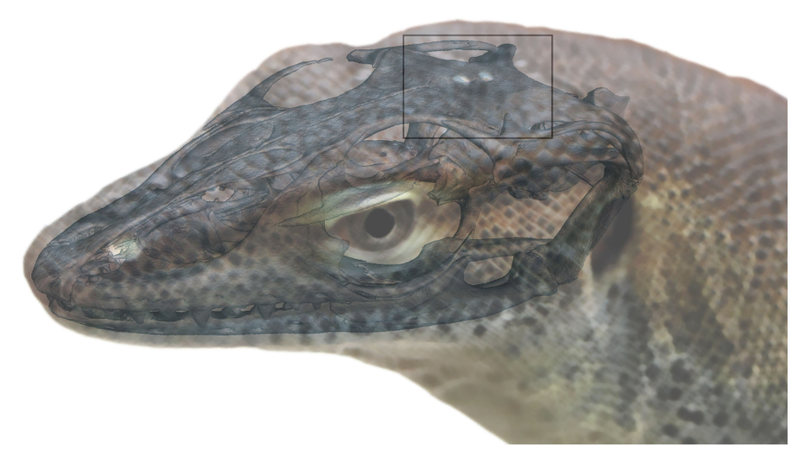 In addition to its regular pair of eyes, the extinct monitor lizard Saniwa ensidens featured a third eye, a structure known as the pineal organ, and a fourth eye, the parapineal organ. These light-sensitive structures sat atop the creature’s head, likely helping the lizard to orient itself and to track seasonal cycles, according to new research published today in Current Biology. So-called “third eyes” are known to exist in a wide number of lower vertebrates, such as fishes and frogs, while third and fourth eyes have also been documented in jawless lampreys. But this is the first time that both the photosensitive pineal and parapineal organs have ever been seen in a jawed terrestrial animal. These organs don’t blink or feature eyeballs that move around; they merely absorb and signal the presence of light. It may seem a stretch to call them eyes, but Krister Smith, the lead author of the new study and a researcher at Germany’s Senckenberg Research Institute, believes these added eyes are deserving of the name. These added eyes, he explained, develop in the same way as our conventional, or lateral, eyes—that is, as an outward growth of the developing neural tube that eventually gives rise to the brain and spinal cord. Additionally, the extra eye is a ball-like structure that includes a lens-like and retina-like layer that’s separated by a fluid-filled space, while the skin above it is usually transparent. The analogy to the lateral eyes, while not exact, is close, said Smith. In terms of function, Smith said we can only speculate. CT scan showing where the pineal and parapineal organs were located on the lizard’s skull. Tens of millions of years ago, when mammals began to assert themselves in the wake of dinosaur extinction, the “third eye” was a common feature among many primitive vertebrates. Over time, however, this added eye began to fade away (it “regressed,” in the parlance of evolutionary biologists), and for reasons that aren’t fully understood. Among birds and mammals, the pineal organ became part of the endocrine system, which is responsible for secreting hormones into the blood. In early mammals, this evolutionary transformation may have had something to do with nocturnal living, but scientists aren’t entirely sure. What’s more, scientists aren’t even sure which of the two structures, the pineal or the parapineal, initially gave rise to the third eye. To explore this further, Smith’s team used CT scans to analyze specimens of an ancient monitor lizard, Saniwa ensiden, collected during the 19th century in Wyoming. The scans showed spaces where a fourth eye was located. The researchers concluded that the extra eyes of lizards aren’t the same as the added eyes of many other vertebrates, in that they are not formed from the pineal organ (as is typically assumed), but from the parapineal organ. Today, only lampreys form eyes from both structures. The discovery of this “four-eyed” lizard demonstrates several things. In terms of limitations, Smith said it’s very difficult to interpret the purpose of a structure in an extinct organism. In the future, scientists may come up with new idea that leads to a different interpretation of the data, but for now this seems the most plausible conclusion. As a final note, the fossils analyzed in this study were collected in 1871, highlighting the crucial role that museums play as archives of important scientific information.